To clarify, for anyone who's wondering about the age, Draco Malfoy's official birthday is June 5, 1980, as the timeline of the books sets the story in the 1990s. So he'd be turning 35 years old today. And from the sound of it, Rowling still doesn't think he's crush-worthy. 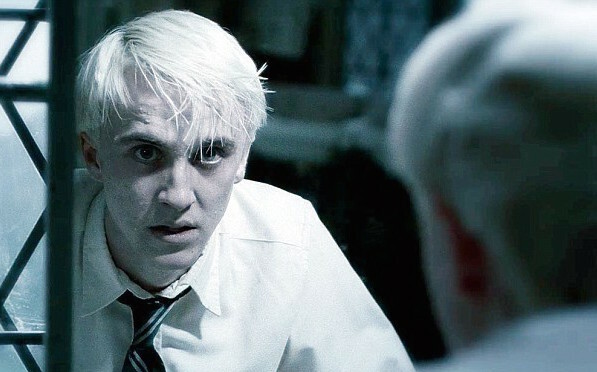 The Harry Potter author went on record at Pottermore last year about how unnerved she is by the fact that girls crush on Draco, despite his 'dubious morality'. And though it sounds like she understands the appeal of Draco, she's still compelled to ward people off. Draco has all the dark glamour of the anti-hero; girls are very apt to romanticize such people. All of this left me in the unenviable position of pouring cold common sense on ardent readers' daydreams as I told them, rather severely, that Draco was not concealing a heart of gold under all that sneering and prejudice and that no, he and Harry were not destined to end up as best friends. By her recent Tweet, it seems Rowling hasn't changed her mind on the matter, even if it's cost her a birthday invitation for the fictional character's figurative celebration. But there is hope for those who want to believe Draco grew up to be something more than just a spoiled wizard. Rowling's Pottermore essay includes some speculation on the man Draco Malfoy might have become, and that includes an interest in alchemy. However, his strange interest in alchemical manuscripts, from which he never attempts to make a Philosopher's Stone, hints at a wish for something other than wealth, perhaps even the wish to be a better man. So, I mean, there's always hope, right?